(Los Angeles, CA) - The Academy. Nike. Day 2. Coming off a senior heavy year, the 2017-18 season will feature a plethora of new talent in the Atlantic 10. With Players like Jack Gibbs, T.J. Cline, and Hassan Martin gone, A-10 teams will be looking to replenish their rosters. Dayton and VCU, two of the conference’s top programs, had a combined nine seniors graduate this spring. If the A-10 wants to continue its streak of putting multiple teams in the NCAA tournament, some of the conference’s young talent will need to step up this season. Here are three of the top freshman ballers to watch for in the fall. In just his second year at Saint Louis, head coach Travis Ford is already bringing in some of the nation’s top talent. Jordan Goodwin, one of the country’s highest ranked shooting guards, headlines Ford’s 2017 recruiting class. ESPN ranks Goodwin as the No. 53 player in the class of 2017 in addition to being the No. 2 prospect from the state of Illinois. Goodwin received a total of 17 scholarship offers, including offers from schools like Michigan State, Butler, Purdue, Ohio State, and others. At 6’3″ 200 lbs, Goodwin has the talent to make an immediate impact on the Billiken’s basketball program. After redshirting last year due to NCAA rules, Kostas Antetokounmpo is ready to explode onto the college basketball scene in 2017. Younger brother of NBA star Giannis Antetokounmpo, better known as the ‘Greek Freak’, Kostas could be the most talented freshman in the Atlantic 10 this season. The summer before coming to Dayton, Antetokounmpo played on the Greek U20 National team and was ranked a consensus top 100 prospect. 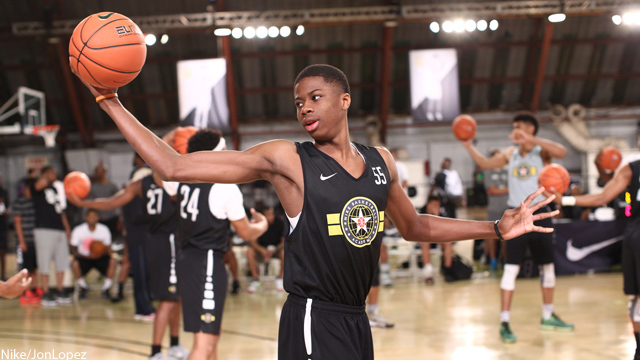 Rivals ranked Antetokounmpo as high as the nation’s No. 89 recruit. Standing 6’10”, Antetokounmpo possesses a very unique athletic skillset. Much like his older brother, Antetokounmpo can handle the ball and shoot well in addition to using his height to block shots down low. While he might not be as polished as some of the other A-10 freshmen, he certainly has the upside to do big things for the Flyers. First it was Steph Curry. Then it was Jack Gibbs. Now it’s Kellan Grady’s turn to show off his talent as Davidson’s next great point guard. As with Curry and Gibbs, Grady might not look like the most intimidating player on the court, but he can shoot lights out. A consensus four-star prospect in the 2017 recruiting class, Grady has the talent to fill the hole left by Gibbs in a hurry. Despite receiving 18 scholarship offers, Grady ultimately chose Davidson in hopes of following in the footsteps of Curry and Gibbs. At 6’4″, Grady has the ability to both see and shoot over most defenders. Assuming Grady follows Bob McKillop’s apparent recipe for success, he could quickly become Davidson’s next feared point guard.